Done. Finished. Over. Not just the test, but the life I lived only an hour or so before now. A life of isolation from the future, trapped between two worlds. #7 is sitting across from me, staring down the brick of a booklet that sits on her desk. I know she’s finished too. I know she’ll pass. Bing…Bing…Bing…The slow repetitive siren of the blinking light in the top left corner of the hall cracks the silence bit by bit, slowly breaking the nervous train of thought that every 16-year-old in this room is running after. Dead in our mindless anticipation. Bing…Bing…Bing…BINK! The silence snaps, we all come running back. #7 swivels her head and looks me in the eye, communicating through her expression a well-expected fear. Her mouth is pursed, her eyebrows slanting up, trying to trap her emotions within. She fears change. I fear change. It's something that as sisters we shared. The change that would follow…the change that would come from this test…this was the change that we feared most of all. Ever since I knew what the Clench was, I’d awaited the exam in complete and utter excitement, thinking in my naivety that I might have a chance of entering the utopia that it is said to be. 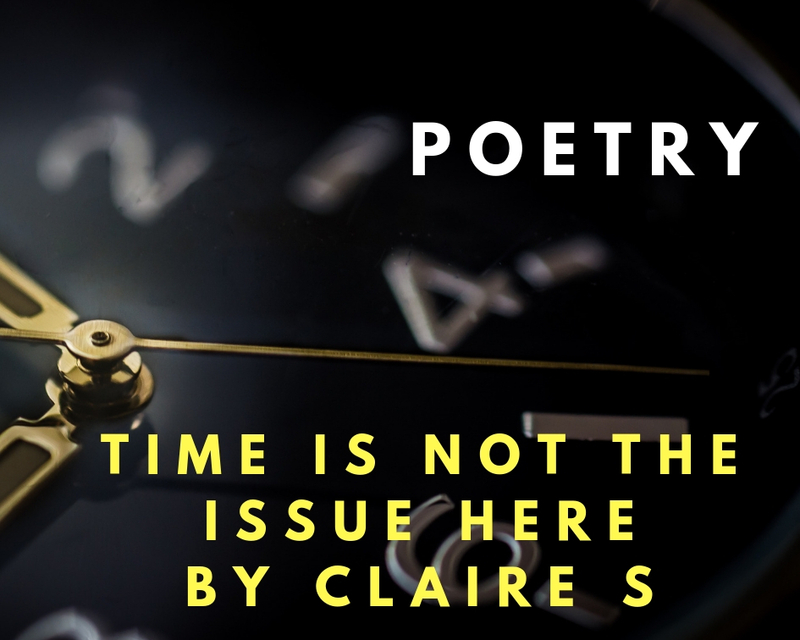 The Clench is a place where time takes no toll. A place of freedom and peace, controlled by a body of the Befores. The Befores and the oasis they’ve created, I’ve only heard rumours about. Waterfalls of white flowing from their faces, cracks and crevices running across their cheeks. Their blood white like snow due to the side effect of the cure. The cure the Befores discovered. The cure to time. This juvenile dream of a picture perfect life though is only in sight for the achiever of the highest exam score. Something that for #7 is realistic, but for me, just out of reach - my being second to her in all our classes at the community. The Out is where I’ll most likely end up. This is a place where time and suffering reigns - an image of what life was like before the cure. It’s here that food is grown and harvested; minerals mined and processed; water sourced and filtered; all to be sent through the gates of the Clench. This is where the 16s who pass, will go. The only ones that don’t have the pleasure of looking forward to a life of slavery, thereof are the ones who fail. The Befores get rid of them. “So, how do you think you went?” asked #22. The question floats around the dining room, willing someone to give in and be the first to set the standard as to whether or not the test was difficult. “Well, I didn’t think it was too bad…I passed for sure, but top result, no way!” #26 breaks. “Yeah, I agree, guess we’ll be working together on the wheat belt then, hey?” #13 confirms. “I guess so!” #26 agrees, shrouding a smile. #26 has always fancied #13. I wouldn’t blame her! Unlike the rest of the boys within the community, #13 manages to hold a civil conversation without making any outrageous comments…he’s also not too bad looking. “What about you #8?” #26 tries to engage me. I choke on my potato mash. “Amen to that!” #26 says, relieved. My words dissolve. Meaningless, pointless…a lie. I don’t know what to say or do. I know what the outcome of the division will be. “I didn’t take it”, she had said. I’d spoken with #7 before dinner. When I asked what she meant, all she could say was that “time is not the issue”. What does this mean, what does she mean? For the last sixteen years of my life, I've been raised as if time were a man with leprosy - a carrier of the least desirable disease, banned from the security of the community. The disease being death. The sound of the lepar’s bell echoed in her words. A considerable lump rises in my throat. Has she lost her mind? I swivel my head away from the conversation and over to my sister, sitting alone at a table in the corner of the room. Her expression is dripping with insanity, a devilish sparkle in her eye as she catches my gaze. I turn away. Turn away quickly. I can’t stand to see her in this state. I’ve never seen her in this state. As I sit, coveting the innocent chatter of the group, I can only imagine what might be going through her head. I don’t know what it is, I don’t know if I want to know. “Please recite the promise,” Leader of the ceremony commands. protected from the toll of time that would be our demise. The rows upon rows of 16s, 15s, 14s, and under echo, the chant, none really dwelling on its meaning, but simply as instructed, reciting. Something doesn’t feel quite right. The thought of what might happen to my sister may be an influence, but the atmosphere of the ceremony hall is dangerous and deceptive. “Could (#) 1, 2, 3, 4, 5, 6, 8, 9…”, she wasn’t called “…98, 99, 100, please step toward the centre.”. We each advance forwards, leaving the hunched, shaking frame of my sister on the outskirts of the circle. A sigh of relief washes over the group as they realise they’ve passed… but the joy doesn’t last for long. “I will now call on those who have passed,” Leader of the ceremony continued. The tide goes out and waves of relief retract. Fear gallops into the room on all fours, ripping everyone apart with its fangs. Silence follows, clutching the empty bodies with its cold hands. This isn’t right!? The crowd shuffles tensely, recognising what the woman’s words mean. This means that it's not only my sister who will be facing an unruly end. This means the rules of the game have changed. “Could (#) 2, 8, 27, 61, 62, and 90 please step forward,” requests Leader of the ceremony. The six of us step with caution. This is not what was planned. This is not good. Silence still holds. A soft whimper of #26 - the only thing to be heard. #26’s tears fall, the envelope opens. “I’m sorry, sir, but it can’t be helped, ” retorts the Leader of the ceremony. “There must be a mistake!” #13 tries again. “It’s for the good of the people,” Leader of the ceremony shuts the conversation down, decisively. BANG!! Gunshots fire beyond the frosted glass doors, puddles of red only just visible. #26 falls faster than her last tear, the puddle slowly growing. With one swift movement, the Leader of the ceremony pushes #13 through the doors toward his death and grabs me tight. “You’re coming with me,” he said. #7 steps into his place, next in line. A freakish smile plastered on her face, as I’m slowly dragged away. Sky. Grass. Glass. Polished. People. Towers. White. This is what I thought I’d see. I'd expected to be met with a perfect city-scape, populated by the most intelligent and elegant people that this world could produce. A literal heaven on earth. Instead, three thin doors at least ten feet tall, leading off the dimly lit room where I stand. My jaw drops. “This is where the examination will proceed,” Leader of the ceremony says, ignoring my shock. The woman’s words are like a dagger pushed through my back and twisted. A dagger I didn’t expect. “Yes. Gas. Then you will be altered, there will be a final polishing process, and then you may leave,” Leader of the ceremony concludes, demonstrating no desire to elaborate. I stare down the door directly to my left, assuming that’s where I’ll start. Before the ceremony of the division, I was in some ways looking forward to my future. Now, I don’t know how to feel. My sister went mad and was killed by a bullet to the head. My closest friends died of the same cause. I slant my eyebrows and purse my lips, holding onto the fond memory of the person my sister once was. The woman turns to face me, pulling my arm tighter, leading me toward the first room. A freakish smile stretched across her porcelain face. “Let’s begin,” she orders emotionlessly. This room’s too small. Not so small, but too small. Practically a concrete box. The only thing within the room is a thin metal bench, adorned with surgical utensils and the bed that I sit on. Above the door that I had come through, a deep maroon ‘2’ within the confines of a thickly bordered circle. The second room, I think to myself. I’m still slightly dazed after the events of the first, it being the introduction to the ‘cure’ in the form of a gas. After the gas was induced, I passed out, since I haven’t been able to look at something for more than thirty seconds without getting overwhelmingly dizzy. I’ve been sitting here… pointlessly pondering the possible reasons for my sister’s death and the turn of sudden lunacy for the last twenty minutes or so, sitting, observing my surroundings. She’d spoken as if she’d been possessed. Like someone had taken control of her body. Strangely, though, she had sounded free. Free from whatever had been haunting her before. Did she know about the outcome of the test? Had she known about this strange examination phase that would take place before entering the Clench? Was she trying to avoid it? Movement beyond the door. I sit. Waiting. Scrunching up the sheets of the bed. Apprehensive. A shout. BANG…Shots fire beyond the door…BANG!! A woman stumbles into the room, a woman that I don’t recognise, bleeding profusely from a wound in her side, holding in her shaking hand a loaded gun. I lean back in shock. Horror, deep red flowing, streaming from her side. All I feel is fear. BANG…! A bullet through the wounded woman’s head. A bullet from just outside the door. The lady with the shaved hair steps proudly into the room, towering over the empty corpse. She turns to face me. Gun at the ready. “One of the aids will be here soon to clean this up", she pronounces every syllable with clarity, "For now, just relax. I’m going to prepare the third room for you. I’ll be back in a matter of moments,” the Leader of the ceremony adds. The empty body of the woman staring up at me from her death bed. My sister and a woman I’ve never met, both already having met their end? The woman who killed them? I slide off the bed, ready to pick up the gun. I don’t notice the woman with the shaved hair burst through the doors. I don’t hear her shout ‘stop’. I don’t feel the cold of the metal in my hand or the wet of the woman’s blood at my finger-tips. For a moment, I don’t feel anything. Don’t go through the third door, I think. Only one escape from this.